In 2001, the late Murray Kleiner and an array of experts contributed to the Handbook of Polygraph Testing, published by Elsevier, which examined the fundamental principles behind polygraph tests and reviewed the key tests and methods used at that time. In the intervening thirteen years, the field has moved beyond traditional polygraph testing to include a host of biometrics and behavioral observations. The new title reflects the breadth of methods now used. 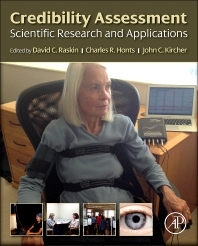 Credibility Assessment builds on the content provided in the Kleiner volume, with revised polygraph testing chapters and chapters on newer methodologies, such as CNS, Ocular-motor, and behavioral measures. Deception detection is a major field of interest in criminal investigation and prosecution, national security screening, and screening at ports of entry. Many of these methods have a long history, e.g., polygraph examinations, and some rely on relatively new technologies, e.g., fMRI and Ocular-motor measurements. Others rely on behavioral observations of persons in less restricted settings, e.g., airport screening. The authors, all of whom are internationally-recognized experts associated with major universities in the United States, United Kingdom, and Europe, review and analyze various methods for the detection of deception, their current applications, and major issues and controversies surrounding their uses. This volume will be of great interest among forensic psychologists, psychophysiologists, polygraph examiners, law enforcement, courts, attorneys, and government agencies. Pharmacological Amnesia: A New Countermeasure Threat? The Future of Scientific Research on Countermeasures? Professor Raskin received his Ph.D. in Psychology from the UCLA in 1963. He has served on the faculties of UCLA, Michigan State, and the University of Utah, where he is Professor Emeritus of Psychology. He was elected a Fellow of the American Psychological Association, Association for Psychological Science, Fellow and Diplomate of the American College of Forensic Examiners, and the American Association for Applied and Preventive Psychology. He served as President of the Rocky Mountain Psychological Association and on the Board of Directors of the Society for Psychophysiological Research. Professor Raskin’s laboratory in the Department of Psychology University of Utah for 25 years was the leader in research and development of polygraph methods and computer techniques for the conduct and analysis of polygraph examinations. In 2009, the Utah Laboratory received the John E. Reid Memorial Award for distinguished achievements in polygraph research, teaching, and writing. That research program continues under the direction of his colleagues Professor John Kircher at the University of Utah and Professor Charles Honts at Boise State University. Their work received Dr. Raskin is an international authority on credibility assessment using polygraph techniques and is a leader in the development and applications of interview techniques, statement validity assessment, and investigative procedures in sexual abuse cases. He has had numerous grants and contracts from federal agencies for research and development of polygraph techniques. Professor Raskin has authored more than 150 scientific articles, chapters, books, and reports, including Scientific Methods in Criminal Investigation and Evidence. He co-organized the 1988 NATO Scientific Conference on Credibility Assessment, the 1989 Cornell Conference on Suggestibility of Children’s Recollections, and the 1994 Norwegian Conference on Witness Psychology: Psychological Methods in the Investigation and Court Treatment of Sexual Abuse. He regularly provides lectures and workshops on polygraph techniques, investigative procedures, interview methods, and analysis of witness statements for federal and local law enforcement agencies, attorneys, judges, mental health professionals, case workers, and government personnel in the U.S., Canada, Mexico, Israel, Europe, South America, and Asia. Professor Raskin has frequently provided consultations to the U.S. government, including the Departments of Treasury, Justice, Defense, Homeland Security, and Energy, the Secret Service, FBI, CIA, ATF, Customs, and Military Intelligence; U.S. Senate Committees on Watergate, Iran-Contra, Armed Services, Foreign Relations, Judiciary, and Labor and Human Resources; the Royal Canadian Mounted Police, Israel Police, and Israeli Anti-Terrorism Forces. He has been called to testify by the President’s Joint Commission on Security, the U.S. Senate and various state legislatures, the British House of Commons, the Israel Knesset, the Israel Supreme Court, and federal and state courts in the U.S., Canada, and Sweden. He has presented expert testimony on polygraph techniques, interview and investigative methods, and children’s statements in more than 300 federal and local courts and administrative proceedings in the U.S., Canada, and Sweden. Professor Raskin is president of Scientific Assessment Technologies, Inc. In the 1980s, he and his partner Professor John C. Kircher of the University of Utah developed the first automatic computer techniques for analysis and decision-making for polygraph examinations. In the early 1990s, they developed and introduced the world’s first fully-computerized polygraph system the CPS, which scientific research has consistently shown to be the most accurate system available today. Professor Raskin is presently working with Professor Kircher and his colleagues at the University of Utah on the development and application of exciting new ocular-motor techniques (ODT) for detection of deception. Charles R. Honts, Ph.D. is Professor of Psychology at Boise State University. He received his Ph.D. in Psychology at the University of Utah in 1986. Professor Honts continues a 31-year research program that focuses on applying psychological science to real world problems. He is internationally recognized as a leading expert on the credibility assessment. Professor Honts has also published and given expert testimony in the areas of interrogation and false confession, eyewitness identification, and the forensic interviewing of children. Professor Honts is frequently invited to lecture in a number of domestic and international venues. Professor Honts has given lectures and continuing education in the United States, Canada, China, Columbia, Israel, Italy, Norway, Sweden, and The Netherlands. Professor Honts frequently appears in courts around the world as an expert witness. Professor Honts was the President of the Rocky Mountain Psychological Association for the 2005-2006 term. Professor Honts has published and/or presented more than 300 scientific papers on deception detection. While at Boise State University Professor Honts has received over $800,000.00 in external grant support. Professor Honts’ current research focuses on improving the standardization and criterion validity of the comparison question test for psychophysiological deception detection, deception detection at portals, interrogation, confession and false confession phenomena in real world contexts. John C. Kircher is a Professor of Educational Psychology at the University of Utah. He received his Ph.D. in Psychology at the University of Utah in 1983. He has over 80 peer-reviewed scientific publications and technical reports in the field of psychophysiological detection of deception. He has received over $2.1 million in 26 grants and contracts to conduct research on the detection of deception from the U.S. Department of Defense, the National Science Foundation, the Central Intelligence Agency, the National Institute of Justice, U.S. Secret Service, and other organizations. Dr. Kircher has published nine computer programs for processing polygraph and oculomotor data to detect deception that have been used by the federal, state, and local law enforcement agencies as well as private polygraph examiners. Dr. Kircher has served as a consultant to the U.S. Department of the Army, U.S. Department of Defense, U.S. Secret Service, U. S. Department of Homeland Security, National Science Foundation, National Research Council, Royal Canadian Mounted Police, and numerous state and local police departments. He and his colleague Dr. David C. Raskin laid the scientific foundation for the first computerized polygraph system in 1979. They wrote the software and designed the hardware for the first computerized field polygraph in 1991. Their computerized polygraph systems currently are used 12 countries. Dr. Kircher and his colleagues also developed the ocular-motor deception test that currently is being field tested in Colombia and at Fort Meade, MD, and is scheduled for large-scale operational field tests by the federal police in Mexico City. The ocular-motor test is a novel deception detection technology that has numerous potential applications including pre-employment screening, visa screening, and periodic testing of personnel charged with national security or law enforcement.